Our Summer Destination this year is Co To Island, I am very excited since this is the off-the-beaten-path place and for the real explorers like US! 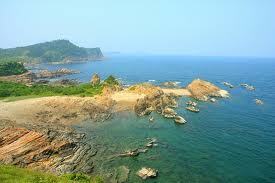 I feel the excitement like those when I first came to Con Dao island (South of Vietnam). Co To island is an archipelago (50 islands) located in the Gulf of Tonkin, including a large Co To Island, a small Co islands, the island of Thanh Lam, Tran and countless islands and small island. Hanoi to Van Don: From Hanoi, transfer by road (private vehicle or bus, but recommend private vehicle because the bus can take forever to get there, and you may miss the boat from Van Don to Co To. Van Don to Co To: Boat is the only way to get in Co To. The boat starts from Cai Rong town (Van Don – Quang Ninh Province). Boat will run through the Bai Tu Long Bay, to pass to Quan Lan Island and come to Co To island, each trip takes between 3 to 3.5 h depending on the weather. Rock Garden. 1km from town centre. Most beautiful place in main coto sign. Lion Mount: on the sea. Beetween Small coto and Xoi island. The best way to visit all these sites is renting a motorbike to stroll around. Co To’s previous name is Chang Son (Chang Mountain) – was an resident place of fishermen in the North East area, but was invaded by the Chinese pirates many times. Before the Nguyen dynasty, some Chinese resided on the island together with the Viet. 1832, Nguyen Cong Tru – the Chief of Hai An (Hai Duong – An Quang) was granted by the Emperor to establish villages on the island. The first village’s name is Huong Hoa. A lot of resident from Quang Zhou, Hainan moved onto the island since then. During French Colonial, Co To is an island has 5 distructs (East, South, West, North and Middle part), belong to Hai Dong , Hai Ninh Province. The French also took control of Hon Gai area and Hai Phong Wharf. November 1946, Ky Con Team from Hon Gai used Le Creyac battleship to go to Co To to make revolution but failed. Until 1955, after Geneve Decree, the French left. Before 1978, Co To islands is the prosperous town with 6,740 people. after 1978, the Chinese returns to their mainland, on the island only have 10% population left. From 1994, more tourist services are slowly developed on the island for locals but not yet blooming to the international travellers. Today Indochina Voyages team celebrates Lan’s birthday. Lan is working in IV as an accountant. Oh yes, she is sassy and persistent. I know I am a little exaggerated on the “sassy” part but Persistent she is (which drives me crazy sometimes because I will stop anything I am doing to finish up the business with her, rather than letting it for the next day). Kudos to her! Lan joined the team earlier this year but she is doing very well. Tourism accounting can be simple yet complicated, but I don’t see it’s an obstacle for Lan at all the time she is working here. Everybody is happy with her work in the office. And everybody love Lan’s little angel – cutie pie Lam – she is just over 15 months by now and she saved her first word “Mommy” to call Lan this morning. How wonderful it can be when your little kid call you first time “Mommy” or “Daddy” on your birthday? (tears in my eyes!!!). And Lan is expecting the 2nd child in early October this year. Wish everything goes smoothly to her family! Back to the party, we decided to go to Pepperonis – the popular Pizza house in Hanoi, yet it’s very common for many of you to eat pizzas, it’s a chance for us to change our taste – something that not RICE (well pizza dough is made from flour, but still, it’s not RICE). The table is full of salad, very tender ribs, big Pizzas and chips. And cant forget the Birthday Cake, which made by .. me (please, let me two seconds to brag about myself here). Lan asked me if I created the idea myself. Unfortunately, I am not that creative and such a newbie in bakery industry. The idea I got from Pinterest and it looks way better than this. But hey, first try not bad right? Scrapbook – a birthday gift from Long (which I helped a bit to arrange the pictures since Long is on trip in Saigon). Lan was amazed and very happy to see her own photos with sweet words. And IV team also gave her a small purse, hope that she will always full of money in there (means the company has LOADS of money!!!!). Mean our pay everymonth will be extremely high!!!! We ate, drank, joked, sang birthday song, took photos and even went after for another round of coffee (thanks to Nam to pay the debt he owes the team for so long :-P). So we are excited to look forward to another member’s birthday, to be closer to each other, like brothers & sisters-in-arms, to live, to love, to work in our little second family. Again, happy birthday to Lan and cheers to the others!